New material will be coming very soon! I really want to build this new site up and put more things out than this blog. If you are anything like me, the football season can be a grind. Lots of long 12+ hour days at the school, plus time at home watching film, writing notes, and planning out both your game plan and practice plan. I just stumbled upon the best way to save yourself hours of time in your game plan and practice plan preparation each week. I hate scripting plays, it takes a while to write down the exact formation, motion, and play you want, over and over for all of your team/inside run/7on7 reps for each practice. Half the time I end up just "shooting from the hip" and call plays off the top of my head. The problem with this is I end up leaving out plays I knew I wanted to get to, or I do not give plays enough reps during the week to feel good about calling them Friday Nights. I have worked with Coach Grabowski and his company Coaches Edge before and think they do a great job integrating technology and coaching. 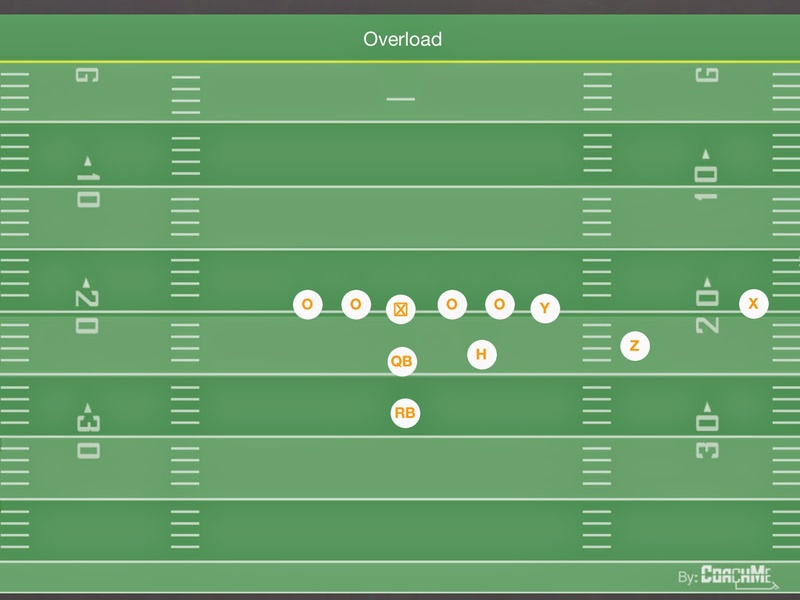 Coaches Edge has put out a new game planning and practice planning software meant to do a lot of the work for you and save you hours of time every weekend. What does it look like, and how does it work? You start with the "Game Plan Board". This is what makes it all work. Here you have assigned cells to enter in all of the specific plays you want for the week. Fill this in with your staff and you are ready to go. It separates the plays out by hash. You enter your terminology for personnel, formation, motion, and play. You enter the top plays you and your staff have decided on for that opponent in the given situation. There are spots for your top inside runs, coming out runs, red zone and goal line, quick passes, screens, and dropbacks. You can enter different plays, double up on core plays, or run them from different formations or different window dressing if you want. Once you have filled in all of the cells, that is it, your work is done. You can even enter different defensive looks (fronts and coverages) you want to see in each practice. Once you are done the next 3 tabs look like this. Your inside run, 7on7, GL/Redzone and team time is scripted for the entire week. Each play you entered into the "Game plan board" will be repped a set number of times throughout the week, insuring that your players got an adequate amount of practice reps to execute it on Friday night. This is the biggest advantage for me, my scripts for the week are done, and I am focusing on more specific game situations than I ever had when planning in the past. I just began using this tool over the weekend, in preparation for a scrimmage. After watching film and consulting with my QB/Pass game coordinator, it took less than 30 minutes to fill out our game plan board for our scrimmage opponent. 30 minutes, hours of work/planning done. The practice planning/scripts are just the beginning. There are other tabs, with plays pulled directly from your "game plan board". 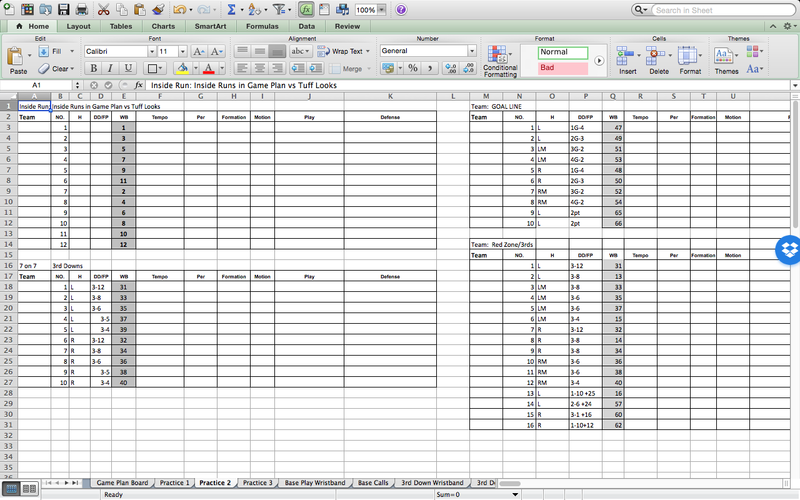 Base Call sheet: A playcalling sheet, split up from Left hash plays to right hash plays. Your top inside runs, perimeter runs, quicks/screens, dropbacks. This is another thing that really makes this worthwhile to me. I hate taking the time to make up a call sheet. I now have my call sheet ready, and I love that it is split up by hash mark. In HS football, we are almost always on a hash, makes it easy to get the correct play in quickly. Has already helped us with our tempo. 3rd down wristband: a wristband of the playcalls you entered for 3rd down situations. Quick reference to go to on 3rd down when you need to get the play in fast. Situational Calls: call sheet, separated by hash, and split up by situation. Coming out, 4 minute O, different red zone areas, 2 point plays. 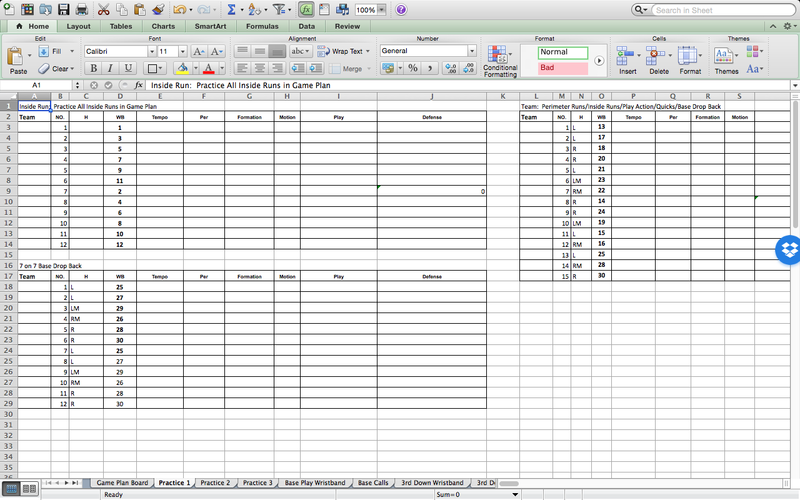 Can I just say again how much I hate making call sheets, and how much easier this is! 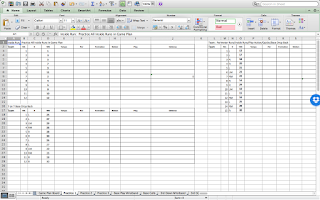 Game Plan worksheet: Just like the "game plan board" but larger blank cells. Ideal for printing out, and filling in during staff meetings as you decide on what specific plays/formation/tags will be best for you. Post game report: Has your exact plays from practice, with the number of reps each play got in practice. There is then a spot for you to record how many times you actually ran that play in the game. This is made for you to self evaluate and make sure you are calling the plays in the game that you are spending your time/reps on in practice. If you rep a certain play 6 times, but you didn't run it once, you are wasting your time in practice. so for $44.99 you are getting something that saves you hours of times, and helps you be more efficient with your practice reps.
For the hours of time it will save you each weekend I think it is well worth it. Once you have it, you can continue to use it over and over again, every week, every season. I highly recommend this. I have been raving about it to my friends in the coaching community. Work smarter, give this a shot, and see how much easier it is on you in your preparation for practice and games. Putting size on to players is a difficult but crucial part of off season development as well as in season maintenance. I have coached at 2 schools are the lowest end of the socioeconomic spectrum. Most of the kids struggle to get enough calories in their bodies to just maintain while working out, let alone add on size. I have always heard stories of teams giving protein supplements to their players but legally this is a huge NO NO, and i highly advise against that. I want to share some perfectly legal things I have done, to help my players eat more calories throughout the day, to help them put on some size and strength. We have a pretty robust After School Program here with a number of academic and enrichment activities. Our off season weight lifting operates along with the "FIT Club". Any student who participates is given a free snack, and a free dinner. This is a great resource to have and I know we are lucky to have it. This is the easiest one for me, because it is completely free to our students and myself. I just have to take attendance everyday, and the students who come and stay for the duration of our workouts get a snack from me on their way out the door, and can go to the cafeteria for a dinner after that. I personally buy all of the extra food out of my own pocket. I keep my receipts, and document the cost of my donations on an excel sheet. The ideas I am going to share below are calorie dense, and relatively cheap. Teacher's obviously don't make a whole lot so I try to get the most bang for my buck in terms of calories per dollar. I also take what they like and some variety in to account. The kids have to WANT to eat in order to get big. Every kid says "I eat a lot"... no they do not, otherwise they would have no problem putting on weight. There are plenty of apps that can calculate basal caloric needs (at least ballpark range) based on age, height, weight, and activity level. You need to add 500 calories to that amount, every single day just to gain weight at a rate of 1lb per week. If a kid is really active, add more. I have a large table in the back of my classroom. I keep it stocked with Peanut Butter, Jelly, and Bread. PB and Jelly I have found is usually cheapest in double packs at Costco or Sam's Club. I usually get the bread from a local discount grocery store, they are under $1 a loaf. This is a really easy way to add calories, kids can come in any time, make a sandwich or two in about 30 seconds and head to their next class. I have a big group of kids who come in and make one every day before school otherwise they would never eat breakfast. I keep plates, napkins, wipes, and plastic ware all on the back table so they can clean up and make their sandwiches without having to bug me. Probably the best bang for my buck and can feed a lot of kids for cheap. These are great. I use these for a few specific kids I am really trying to bulk up with extra calories. Each of these 3 items cost less than $1, and the kids love them. Yes there is a lot of carbs and fat, but there is also a good amount of protein. They just need calories. The cheesburger Mac is every kid's favorite, they absolutely love it. The Totino's pizza is a great value, only a dollar, and it is 680 calories if a kid eats the whole thing. I have a full size fridge/freezer next to the PB&J station and I keep the freezer stocked up with these items. 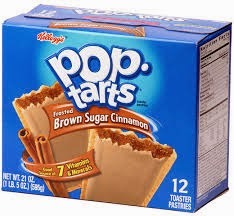 Pop Tarts are great. They are cheap and pretty calorie dense. The 2 pastries that come in each foil pack are usually at least 400 calories total. I can get 4 packs for under $2. That is less than 50 cents for 400 calories. It is pretty much all Carbs but I have found them to be really convenient when a kid doesn't have time to make a sandwich, or I want to give him something he can put in his backpack, and eat later in the day for a snack. In the WR sweep, I wanted another way to get our WR the ball, that didn't use motion. As we started having success using jet sweeps, defenses started attacking the motion hard. We used a Wing position to bring our WR closer to the ball. You could accomplish this by using a slow motion or orbit motion as well. or as Coach Gruden calls it, "Spider 2 Y Banana"
This is a great answer as teams load the box, or crash down hard in an attempt to take away Power. This play gets better and better with the more players the defense aligns on the LOS. More guys on LOS, less guys who can cover. We even got some teams into an alignment where their end man had to take on FB as well as cover him man to man... that is like stealing, if he can stuff our FB he can't cover him, if he can cover him, we are getting easy kick outs. Either way we win. 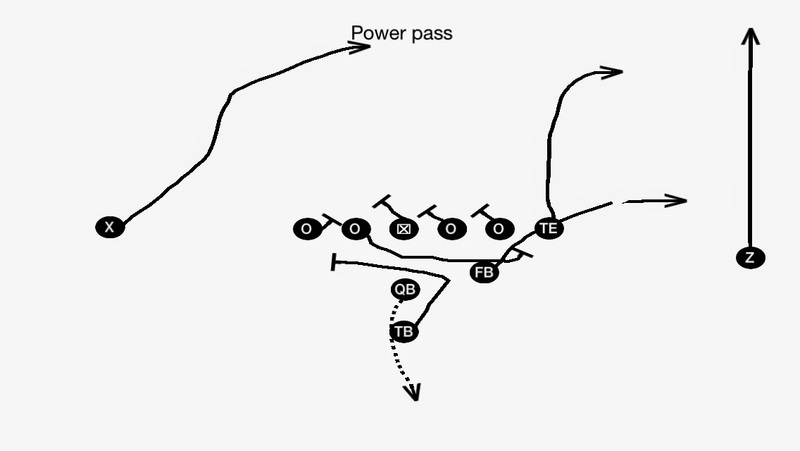 The route concept is a standard flood play. WR clearing out. a TE (or slot to twins side) running the medium route in the flood, and the FB chipping the DE on his way to the flat. You can read this deep to short, or short to deep. I have done it, and seen it done both ways successfully. In my opinion what really makes it work is making it look identical to power. So we block it the same as Power. Playside down blocks, BSG pulls. BST protects b gap. The only difference is our pulling BSG needs to attack the C gap, rather than work up to a LB. I need to do a better job coaching this up next season. Our biggest problems came from back side pressure, usually frontside pressure meant the TE or FB was wide open and we hit it quickly. One adjustment I have seen and will use int he future is to have the Rb cut back immediately after the mesh, to pick up the backside C gap. You can use backside WRs to run backside drags, or attach another TE to help secure the backside. I can't stress enough how helpful the OL play is on selling play action. We do not pretend to block power, we full on block power, we just don't drive anyone past 2 yards down field. Below are 2 clips of power pass, one hitting the TE, one hitting the FB. This is just our base power pass that we install in spring ball. We can run a variety of concepts off of power action. The play stays consistent for the players in the box. Power pass action works great to throw double posts, post/dig, verticals, or whatever dropback you hang your hat on. We would release our TE/FB into routes as well as keep them in for max protection on certain concepts. Power pass is a the perfect constraint when defenses start cheating. I should have called it more times last season and it will continue to grow into bigger weapon in our arsenal. 3 years ago I started an "off-season points program" for our kids. Players are expected to earn a minimum number of points either by playing other sports or lifting with me after school. There are a lot of kids, and since our off season program runs from January - May, a lot of days to take attendance. 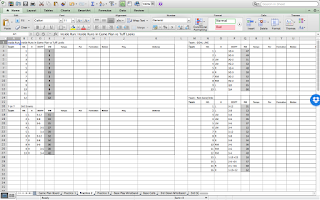 This isn't rocket science but below I share how I take roll every day, and am able to track every member of our football program, using excel. I can not imagine running Power without running Counter. The two plays go together very well and the cutback action of counter will hurt defenses who flow very fast to the RB's initial path. 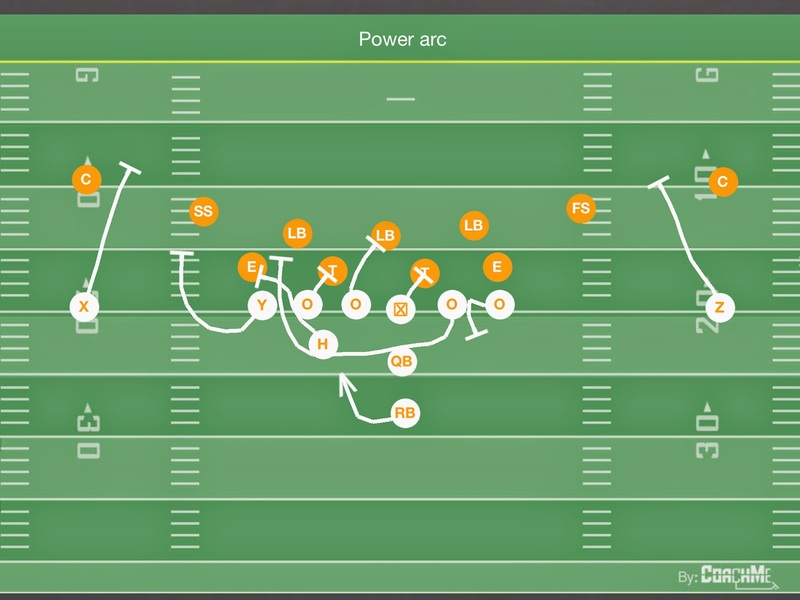 It is also a great answer to teams who want to load up to your FB or strong side in an effort to shut down Power. This is all the same in every Counter we run. Our variations come from who our 2nd puller is and who secures the back side. Our 2nd puller is also called the "wrapper" because they will wrap inside of the guards kick out block to lead up on the play side LB. If the opposing DE steps down to wrong arm our guard will drive this, logging the DE, and our 2nd puller and Rb have to read this and bounce around it. This is very similar to counter FB, but we run it from double tight, we use our BS TE as our 2nd puller since we don't have a FB in the game. This was a great play for us, the extra gap in double tight was great for us because it isn't something you see much with so many teams spreading out on Offense. Being in this balanced look up front also helped to stop teams from loading up one side to shut down Power. We could line up the same and call the play either direction. We miss a down block in this clip but it is a great example of our 2nd puller working down the field to spring us for a huge TD. I didn't run this scheme often but it had serious big play potential because we are aligned in a heavy formation to the strong side, but then pull 3 players to the weak side. In super counter, we have 2 wrappers. We pull both the FB, and the TE up through the hole to lead for the RB. Yes it sets us up in a very heavy formation to the strong side but i feel it makes play calling easy, it all comes back to numbers and seeing how they adjust. We used this formation for some play action shots and if I felt they were loading up to the overload side, we could run power to the weak side. The clip below is an example of weak side power away from the overload, it isn't blocked great, we miss a down block, but we are able to punch it in. Small adjustments like this are great wrinkles to mix in through out the season. 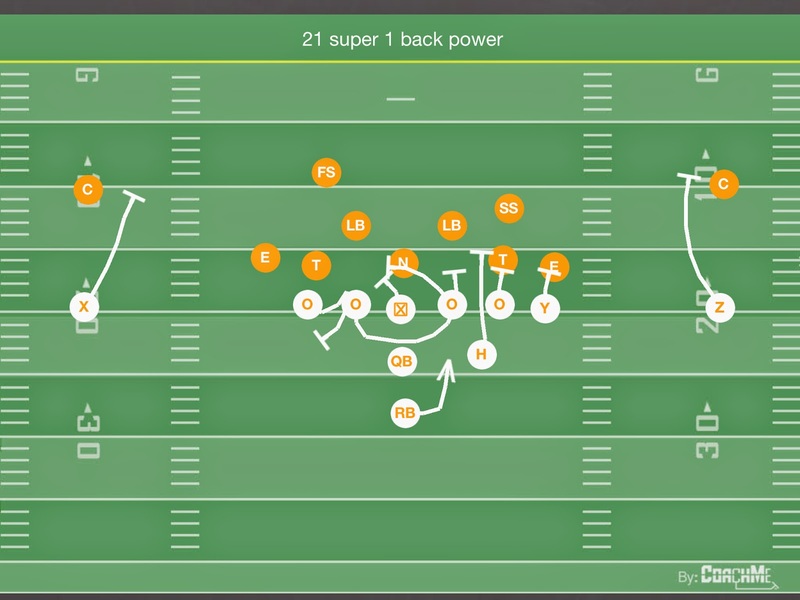 It just expands a base play by using another formation. This can be difficult for a defense to line up to, especially if they haven't seen it on film to prepare for it. My only caution is to have something ready in the play action game, and back to the weak side, so you can take advantage when they over adjust to stop that strong side run. Today's power variation is simply combining two concepts I have already discussed. 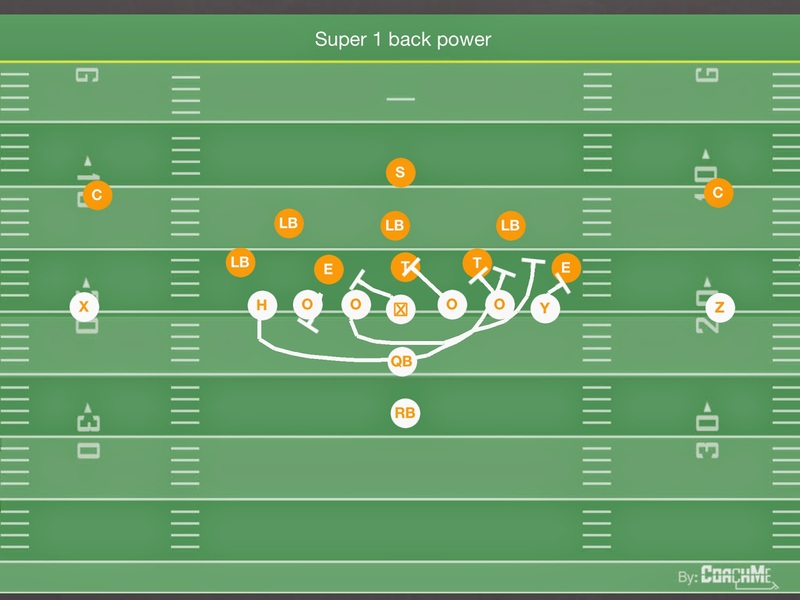 From our double tight formation we would run 1 back power (because we don't have a FB in, we are in 1 back) and I would add our super tag on to tell the back side TE to also pull. This is the simplest tweak we have in my opinion. "Arc" simply tells our end man (could be the TE or the OT to the weakside) to Arc release instead of their usual down block. They will open up wide, trying to clear the DE, and block the defenses force (OLB/SS depending on defense).